It’s that time of year when our thoughts turn to chocolate eggs, but how much do we actually know about the non-confectionery versions? Unlike their chocolaty counterparts, they are highly nutritious, versatile and cheap and come in their own unique packaging. There are so many varieties on the market that we thought a chat about which ones work best for which purpose. Rolline Frewen, Founder and Director of The Admirable Crichton also chats about her own chickens who live in the grounds of her beautiful Yorkshire home. Let’s start with the staple. We see them every time we shop; we cook them in an vast array of ways both in their natural state and hidden inside so many great British staple dishes. What would we do without them? We all know how to fry, scramble and boil eggs, but who doesn’t have the memory of turning the empty shell upside down and popping it back into the egg cup to trick your Father? These are larger than hen’s eggs and are ivory in colour. The flavour is stronger and richer due to the fat and protein contents being higher. We recommend that you use them when you want a distinctive egg flavour that will stand up to strong flavours such as smoked bacon. They can be substituted for hen’s eggs but cook them carefully at a lower temperature as due to that higher protein content again, as they tend to go rubbery if overcooked. AC idea: They are great for baking due to their rich properties. Treat them as you would a large hen’s egg. The largest eggs featured in this blog. They taste somewhere between a duck and a hen’s egg. They are less widely available for purchase and therefore are quite expensive. One medium goose egg is equivalent to about two large hen’s eggs and has a larger yolk to white ratio, causing baked goods to be heavier. AC idea:Simple pleasures are often the best. Simply serve a buttery scrambled goose egg on a toasted muffin. Delicate, tiny, speckled quail eggs can be boiled in less than two minutes and are more easily peeled once they’ve been plunged into cold water and gently rolled to release the shells. They can be really are quite fiddly to prepare, but children adore them and will often eat them when they reject hen’s eggs. AC idea:Add them to salads and pizzas or serve as canapés with a little chilli and lemon mayonnaise. For another simple canapé, gently break them with the very tip of a knife and gently fry, placing them on top of home made fried bread circles, lightly flavoured with chilli or garlic oil. You could also sprinkle the hard boiled eggs with smoked salt or dukka, an Egyptian mixture of herbs, nuts and spices. They are also delicious when pickled. These are the deep brown eggs that look so appealing in the egg section. This traditional English breed lays eggs with dense, yellow yolks and shiny whites that can be used in the same way you would standard hen’s eggs. AC idea:How to make the perfect fluffy omelette will be our next blog, so why not try Burford Browns? Remember they are fairly small, so you may need to add an extra one per person. Again, these are not widely available partly because the good old Turkey produces fewer eggs than the chicken. The yolk to white ratio is around 50:50. They do taste similar to hen’s eggs although the yolk is slightly creamier. AC idea:Spruce up a full English breakfast by serving fried Turkey eggs instead of your usual variety. It will make guests talking about your innovation as well as have them licking their lips. Ever spotted the beautiful aqua blue eggs that look so appealing among the usual suspects? They’ve been laid by Old Cotswold Legbars. They don’t like to lay as many eggs as standard hens, so of course they are more expensive and harder to buy. The shells are thicker and the yolks larger, but otherwise taste very similar. AC idea:These are delicious as part of the AC’s version of Eggs Benedict; a dish that really should not only be eaten at breakfast. Cook in the normal way adding mushrooms, smoked gammon, raw spinach that wilts beneath the gammon and a little sprinkling of truffle or truffle salt. These are only collected by licensed ‘eggers’ during the three to four week nesting season starting in early May. Only one egg is taken from each black headed gull’s nest to ensure there are still eggs to hatch. They are a most beautiful grey/greeny/blue with brown speckles, the size of a bantam’s egg (about half the size of a hen’s egg) but more pointed so they don’t roll out of the nest so easily. The egg yolks are a deep orange and the cooked whites have a creamy texture. AC idea:Being wild, they are an expensive and rare delicacy and are often eaten hard boiled with just celery salt or sometimes asparagus as well. 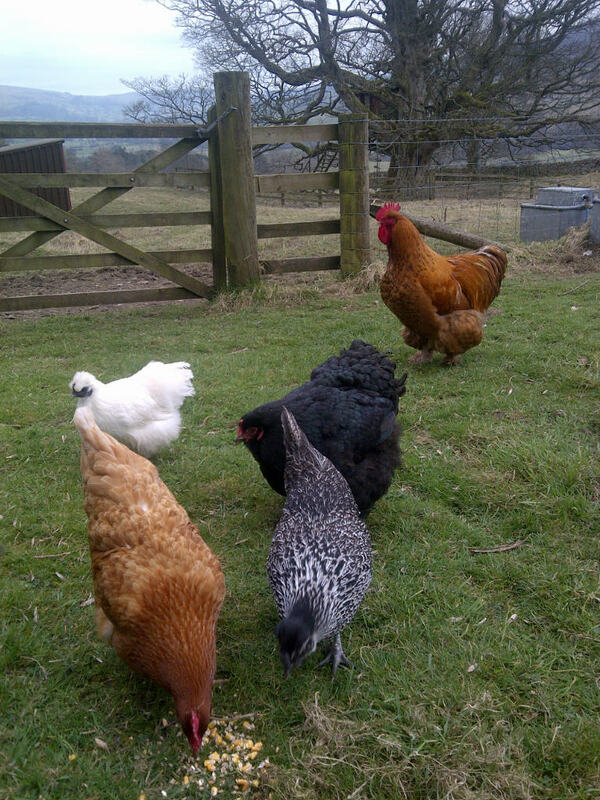 At last, as the days are longer and warmer, we are getting a good supply of up to six eggs each day. A huge improvement on the odd one we were getting during the winter. Our mixed flock are watched over by Marmalade, the orange Orpington Cochin cross in the orchard and only the three Lavender Pekin hens live near the house so the flower beds are not completely scratched out over the terrace. Rolline’s AC idea:We often end up with too many eggs, so left over cheese soufflés are regularly on the menu. We can’t leave without a mention of some eggstreme chocolate eggs. Here’s some luxurious hand made artisan eggs for that eggstra special someone. Fraise Sauvage in Hackney has a new range of chocolate eggs this year. They include a Golden Freckled Egg (Femmes de Virunga, a smooth and rich, oganic dark milk chocolate, speckled with gold and filled with salted caramel truffles) and the The Mixed 1⁄2 Doz above (Dark, milk and white chocolate “in case you can’t decide which type of chocolate you want”. They’re available in the Hackney shop and at Eat 17 in Walthamstow too. We hope you’ve found this eggstraordinarily interesting and will look out for our blog on how to make a great omelette, the second part of our Dishes to cook on lazy evenings series.